Biju's Strawberry Tea is a cut above the rest. Made with freshly brewed green tea and strawberry nectar, it even has strawberry bits in it! 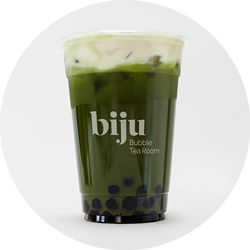 Biju Green Tea with Honey is the perfect drink for the health conscious. Honey has long been used not only for its health properties, but for its great taste. Lychee nectar is added to freshly brewed black tea, and shaken with ice. The combination of lychee's slightl tang cuts perfectly through the bitter black tea. An exotic and tangy tasting Iced Tea. Passion Fruit Nectar is mixed and shaken with fresh Jasmine Green Tea to create a drink that's both fruity and sour. The taste of a ripe and juicy peach is captured in this tea. Peach Nectar is shaken with Jasmine Green Tea to give a sweet, slightly sour and always refreshing tea. Winter Melon is a large fruit commonly found in Asian cuisine. Used in teas, it gives a rich and sweet taste, akin to caramel. 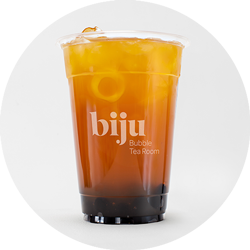 Using the original Thai Tea brand imported from Thailand, Biju's version is creamy and sweet just like how it should be. A strong creamy black tea with spices and notes of vanilla. 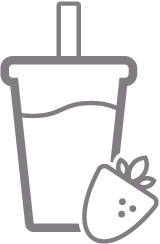 Once mixed with fresh milk, Assam creates a rich, malty drink that's one of the most popular flavours of bubble tea. With flavours of cardamom, cinnamon and black pepper, this soothing beverage is both sweet and spicy. Our Earl Grey has a nice mild hint of bergamot and citrus. Adding milk to this classic blend brings out its perfume-like notes even more. 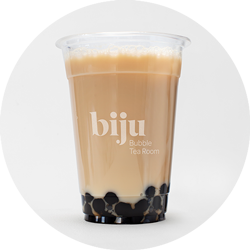 Biju's Hong Kong Milk Tea is made the traditional way. Our own house blend of black tea is brewed strongly, filtered and then mixed with evaporated milk, just like they do in Hong Kong! A strong and creamy milk tea. Picked for its unique aroma and floral notes, jasmine green tea mixes perfectly with milk to make a creamy drink with an alluring jasmine scent. Matcha powder is made by blending whole green tea leaves into a fine bitter powder. We mix this powder with organic milk to create a smooth and healthy milk tea that is packed with antioxidants, bitter and creamy. 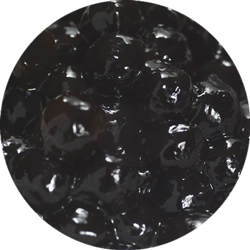 Mixed with milk, this is a special combination that converts many first time drinkers and coffee fans to bubble tea. Also known as Red Bush tea. A favourite amongst the health conscious, this herbal tea is packed with antioxidants, has no caffeine and tastes yummy! 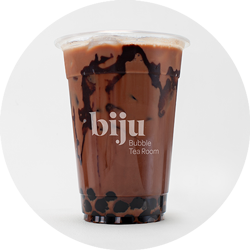 Chocolatey cocoa powder, fresh organic milk and drizzles of dark chocolate sauce make this one of Biju's most indulgent drinks. One of the most refreshing bubble teas. Honeydew Melon Milk tastes like the sweetest ripe Melon, and is a great way to beat the heat. Biju's Mango Milk is reminiscent of Mango Pudding, a dessert from Hong Kong. Sweet as a ripe mango, with a slight tang, if you love mango, you'll love this. Made with fresh organic milk and strawberry nectar, this is fruity and full of strawberry pulp. Taro is a favourite amongst bubble tea lovers. Biju's version is made from fresh organic milk creating an authentic, natural version that is creamy and coconutty in flavour. A unique sweet and savoury mousse turns this Black Tea into a cappuccino-like experience. To taste mousse and tea together sip it without a straw or stir together to create a creamy sweet and savoury drink. Cold Green Tea is topped with Biju's unique sweet and savoury mousse making this drink a cappuccino like experience. Drink it without a straw to get mousse and tea with each sip, or stir it together to create a creamy sweet and savoury drink. Biju's mousse goes especially well with the bitter taste of Matcha Tea to create a unique sweet and savoury drink. Simply stir it all together to create a creamy drink that's both sweet and savoury. Coconut water is nutritious and healthy. It goes especially well with Lychee Nectar, creating a light drink perfect for those looking to rejuvenate without caffeine. Adding pineapple nectar to coconut water creates a delicious combination that is light in calories and perfect for those looking for a refreshing, rejuvenating drink. 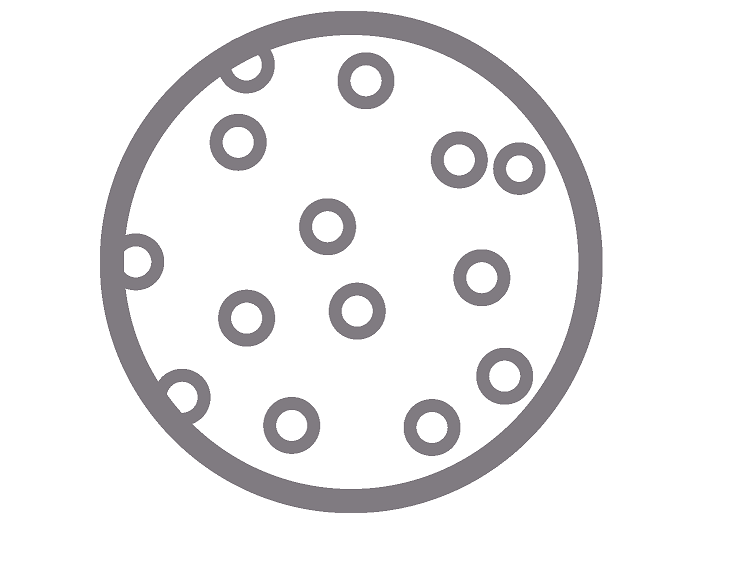 Pearls are made from Tapioca, the starch of the Cassava root. 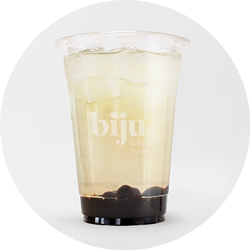 Naturally gluten-free, Biju's pearls are prepared to be bouncy and satisfyingly chewy. A popular dessert in Asia, where it's called grass or leaf jelly. Made from leaves of Mesona, a member of the Mint family, this jelly has a smooth and slightly sweet taste that's refreshingly cool. If you love custard, eggy pudding is the perfect topping. Creamy and sweet, it has a light caramel flavour. Also known as Nata De Coco, this jelly is made by fermenting coconut water, so completely vegan. Fruit juice is used to flavour the fruit versions. It's surprisingly high fibre, low in fat and with zero cholesterol. It’s chewy, sweet and bouncy! Bouncy balls filled with fruit juice that burst in your mouth when bitten into. Fun and tasty, Biju's version is made with real fruit juice and without any preservatives. Flavours include Banana, Asian Lime, Passion Fruit, Mango, Guava and Pineapple. THE superfood. Chia seeds are naturally high in protein, fibre, B vitamins and minerals such as calcium, iron and manganese. Best of all, they are naturally low in calories and are perfect for those looking for a light and healthy option. Every tea is made fresh when you order it. Made without artificial flavouring or sweeteners. Others use powders, Biju goes to the source.